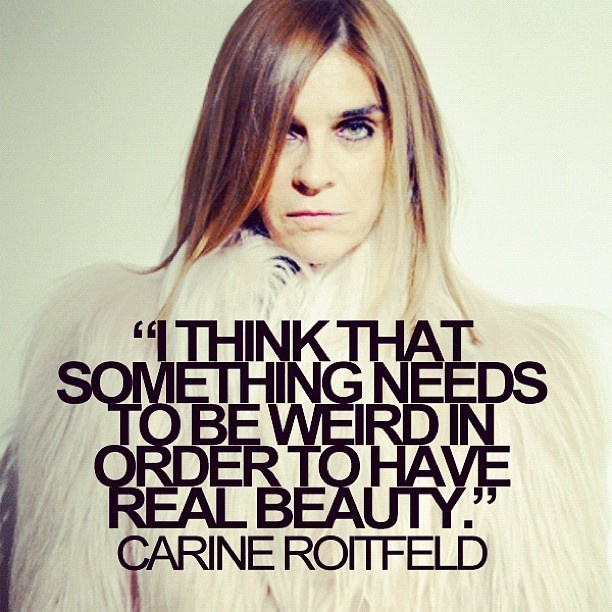 Carine Roitfeld, ex French Vogue Editor and now head of her own fashion glossy, CR, is a rare bird. A woman of intelligence, passion, taste, and an innate sense of style. She espouses effortlessness – carefully considering her appearance without being a slave to it. A smudge of black eyeliner, perfectly imperfect hair, and a wardrobe based on basics mixed with the avant garde. Tastemakers have an innate sense of style not easily imitated. It is what makes them so precious in an age of mass consumerism. Today, we promote a banal, conventional, and cookie cutter sense of beauty and style, splashed across the Bravo network and other reality driven entertainment. The perfectly coiffed and styled long wavy hair that will deflate at the hint of wind, lip-glossed puckers, fake eyelashes, sequins, bling, and the like. Women who can’t leave the house without being ‘perfectly’ made up, from hair, to makeup, to nails, and on and on. The effort screams of exhaustion. Mix and match the unexpected; the look may seem jarring to some, but criticisms often mean you’ve created something original. Appreciate craftsmanship and authenticity in all forms. Don’t be overly fussy; a little worn-in/disheveled aesthetic in fashion, beauty, or design is encouraged. Surround yourself with people who enhance your creativity and challenge you to become a more well-rounded person. A tastemaker doesn’t accept what is, but asks what’s next. They are not afraid of criticism but welcome and almost encourage it. It takes great strength and confidence to find your creative path, but once found the rewards are truly fulfilling. For originality cannot be bought, copied, or emulated. Precious, indeed.